Last week, Taiwan-based technology company Proview took its battle over the iPad trademark from mainland China to the United States, arguing Apple had engaged in deceptive practices to purchase the trademark, and seeking unspecified damages. Now, Proview has amended its complaint: it doesn’t just want damages, it wants its entire 2009 sale of the iPad trademark voided. If that were to happen, Apple would potentially lose the rights to the iPad trademark in the European Union, Mexico, Singapore, South Korea, Indonesia, Thailand, and Vietnam. Apple is famous for its secretiveness, and also famous for playing hardball with trademarks and tradenames it wants to use. After all, it announced the iPhone back in 2007 without nailing down rights to the name. So, what’s going on with Proview, and could this mean the end of the iPad name? Proview’s amended complaint against Apple accuses the Cupertino giant of unfair competition and fraud, including intentional misrepresentation and fraud by inducement. As a result, it wants the whole 2009 sale of the iPad trademark to Apple voided, compensatory damages, an injunction to prevent Apple from using the trademark, and “disgorgement of Apple’s profits from unfair competition.” If Proview can support its assertions in court, it could be in for a very large payday: worldwide, Apple sold 15.43 million iPads in the last quarter alone. Proview wouldn’t be able to get a cut of all iPad sales — sales in the United States and many other markets where Proview never had an iPad trademark wouldn’t be impacted — but the sum would still be substantial. Proview says it and Apple had previously butted heads over Apple registering trademarks similar to Apple’s own, so any trademark negotiations between the companies were going to have to overcome a certain amount of suspicion on Proview’s part. Proview argues Apple was up against a tight deadline to secure the iPad trademark, and therefore, rather than engage in straightforward face-to-face negotiations, created a special purpose company named IP Application Development (IPAD, get it?) for the “false pretext” of purchasing Proview’s existing trademarks to the iPad name. Proview says it tried to perform due diligence on IPAD Ltd’s interest in the trademark, but the process was stymied because Apple was engaging in deliberate fraud. It’s worth noting that the case Proview is bringing in the United States is entirely separate from legal action over the iPad tradename in mainland China — even though the same companies are involved. Taiwan-based Proview Electronics Company Ltd. is a subsidiary of Proview Technology Shenzhen Co., Ltd., based in Shenzhen, China. Proview Shenzhen maintains it still owns the rights to the iPad name. Proview has been bringing its case in various Chinese jurisdictions, trying to block sales of the Apple iPad for trademark infringement. It’s had some success so far, but the next major move will come next week, when the Guandong High Court is due to hear Apple’s appeal of a lower court judgment in favor of Proview. The Chinese case is tied to Proview Taiwan’s case against Apple in only one way: Proview Shenzhen is not challenging the 2009 deal Proview Taiwan made with Apple (or, rather, with IPAD Ltd). However, Apple has indicated that its 2009 deal with Proview Taiwan included transfer of the iPad trademark in mainland China, and Proview has failed to carry out that transfer. The use of special-purpose companies to secure tradenames is not new in the technology industry — it’s also not uncommon in other industries, including real estate, automobiles, and consumer electronics. The idea is to maintain secrecy surrounding new product launches; given Apple’s famous aversion to letting any details slip before a product is ready to be sold, it’s not surprising Apple would use a similar tactic to keep a brand-new, never-before-seen product under wraps. However, just because a tactic is common doesn’t mean it’s above the threshold for a legal definition of fraud or misrepresentation. Proview really did plan to do a product called the iPad — or, rather, the iPAD, for Internet Personal Access Device. That was back in 2000, the days of Palm Pilots and personal digital assistants, and long before mainstream smartphones or tablet devices. 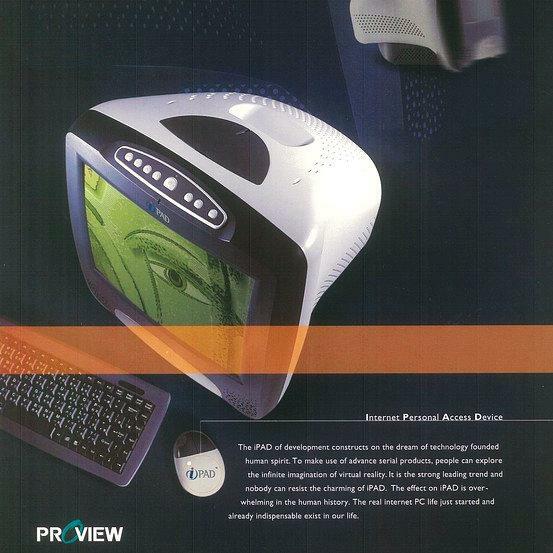 Moreover, Proview’s device wasn’t even portable: it was a lightweight desktop system (with a CRT!) simply intended to provide Internet access. It had a 256 MHz processor, a 15-inch display, 32 MB of RAM, and the high-end model shipped with a 20 GB hard drive. And there’s another twist on the Apple/Proview bitterness here: Proview’s iPAD looks stunningly like…the original iMac. 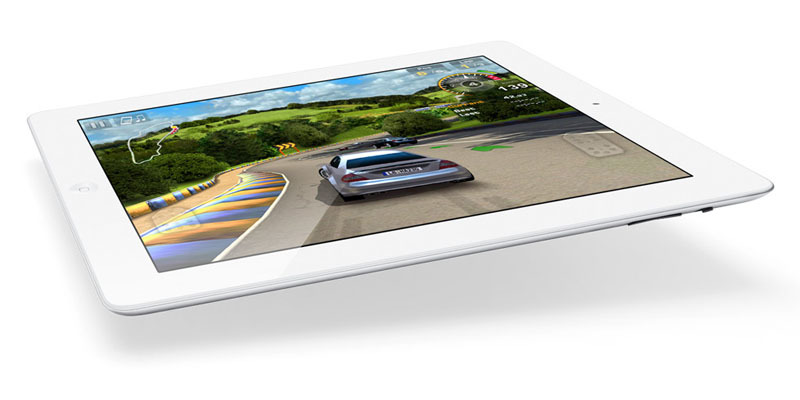 Proview says it spent $30 million to develop its iPAD. Proview’s device failed to gain traction in the market: the company says it made between ten and twenty thousand of the devices from 1998 (the same year Apple unveiled the iMac) to 2009. However, given the device’s antiquated specs, it seems unlikely Proview actually manufactured any “iPAD” systems in the last decade, and Apple maintains the trademark had been “abandoned” by Proview by 2006. Proview also made a bunch of other “i” devices, including an iPDA, an iNote notebook, a lightweight iClient, and an external iDVD player. It’s easy to see how Proview butted heads with Apple over trademarks: for Apple, iDVD is a DVD authoring application in its iLife suite. How successful was Proview’s IPAD? So successful that Proview Taiwan was willing to sell the trademark to IPAD Ltd in December 2009 for £35,000, or about US$55,000. Proview sold the trademarks outright; it did not merely sell a license to use them while retaining ownership. In January 2010 — just after the iPad was announced — Proview came back to Apple, and said two of the trademarks covering mainland China included in the original deal were actually owned by Proview Shenzhen. And the price for those two trademarks was now $10 million. Proview has indicated it would be willing to come to a settlement with Apple over the issue. And, although the company has not indicated how much it’s seeking in damages or how much it would seek in a settlement, Proview CEO Rowell Yang has indicated Proview is looking for as much as $2 billion. And that was before it amended its complaint to try to get the trademark sale voided. Proview’s decision to bring suit against Apple in the United States is almost certainly a tactic to bring additional pressure against the company and try to move Apple closer towards cutting a settlement. The real power of Proview’s move into US courts might not be the strength of their legal argument, but all the publicity their case is generating — including articles likes this. Western media seems to love tracking anything involving Apple. By inserting itself into Apple’s media spotlight, Proview gets attention it never would have received otherwise — and it has a chance to come off as the scrappy underdog fighting a giant, cruel corporation that ripped it off. The problem with Proview’s strategy is time: it doesn’t have much. Proview currently manufacturers monitors for computers and portable devices, but it’s not in great financial shape. The Shenzhen subsidiary is bankrupt and faces delisting from the Hong Kong stock exchange in the next few months. In the meantime, Apple has very deep pockets — about $100 billion in the bank — and can afford to take its time dealing with Proview. In China, Apple’s appeal before the Guangdong High People’s court will be able to include documents that weren’t available in initial proceedings between the Shenzhen Intermediate Court that ruled against Apple. The initial ruling against Apple was due to lack of evidence; this time around, Apple will be able to use documents Proview provided to the court in Hong Kong. Proview maintains that its Shenzhen subsidiary had nothing to do with the deal; Apple claims that the trademark sale agreement was actually signed by Proview Shenzhen’s general counsel, at the direction of CEO Rowell Yang. In the United States, time is on Apple’s side. Proview will likely try to move as quickly as possible for an injunction on the iPad trademark. It’s not clear whether Proview’s assertion that it was fraudulently mislead by IPAD Ltd., will hold water — it’s also not clear that Proview can sue Apple rather than IPAD Ltd. Although it is not unusual for firms to use special purpose companies to keep their product development plans out of the public light, Proview’s claims that IPAD Ltd said they wouldn’t compete with Proview, and may have conducted negotiations using an alias, may give Proview some points to argue. Nonetheless, the fact remains: Proview sold full ownership of the trademarks for $55,000, and thought it was getting a good deal at the time. It was only when the real buyer was revealed to be Apple that the company had second thoughts. Motorola Defy Mini and MotoLuxe impressions: Not good enough for America?